Huge Life-Changing Wins on Microgaming’s Mega Moolah! Earlier this month, a British man playing with Betway Online Casino on a mobile device won a CAD$2.5 million jackpot on Microrgaming’s progressive slot, Mega Moolah. Six days previously, a life-changing CAD$11.46 million payout was won by another mobile Mega Moolah player. That was the second largest payout this year after a CAD$13.5 million payout was won by yet another mobile player in April. Anthony is referring to the “World Record” payout made to a British solider in October 2015. Let’s take a closer look at that win in further detail. 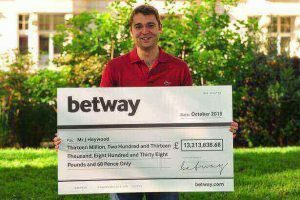 On October 7 2015, at Betway Online Casino, the Mega Moolah jackpot paid out the biggest lump sum in the history of virtual gambling, with Â£13,213,838.68 (over 23 million CAD$) pouched by the then 26 year-old British soldier and Afghanistan veteran, Jonathon Heywood from Cheshire! Exactly how did he win the Mega Moolah progressive slots jackpot? Quite simply, by placing a 25p (42 Canadian cents) wager! When questioned on what he intended to spend his winnings, Mr. Heywood replied “The first thing I will spend it on is the best possible medical treatment for my Dad. That’s more important than anything. Family comes first and I’d give all this money back for him to be healthy again.” Naturally, with watching his bank account swell to an eight-figure sum also treating yourself to something you’ve always wanted and is well deserved. In addition to paying for the very best treatment available for his Dad, Jonathan purchased his own dream car – a yellow Bentley Continental GT! Why is Mega Moolah’s Jackpot Now Won so Often? At that time of Jon Haywood’s World Record win in 2015, the stretch between the previous record payout and the previous jackpot win was the longest ever recorded on Mega Moolah. At that time, the slot generally boasted a payout frequency of around 12 weeks. It was just over 26 weeks previous to that in 2015 when a Canadian player won CAD $7,561,766 – a payout that in itself set the record for the biggest single win on Mega Moolah up to that point – and in the industry as a whole. Since that time, Mega Moolah’s jackpot wins seem to have increased in frequency. Ever since Jon Haywood’s huge win, Mega Moolah profile has soared. Its becoming almost an essential for an Online Casino to include Mega Moolah in their list of online games. More and more of the best and most reputable online casinos are looking to include Mega Moolah in their game line-up including: Bet365, Betway, Jackpot City, William Hill, Spin Palace, Royal Vegas, Ruby Fortune, 888 Casino and All Slots Casino. 2017 has already seen 9 big jackpot winners. This raises the question what is so special about this year that has seen so more Mega Moolah Jackpot winners than usual? Have the game developers, Microgaming, changed something in the game to make the jackpot pay out more often? Definitively ‘NO’. The Mega Moolah of 2017 is the same version that was originally released more than a decade ago. Subsequently, if the game hasn’t been altered, then what else has changed which could explain this marked increase in winners? Of course, the chances of winning the Mega Moolah jackpot is entirely down to chance and naturally, there will be random fluctuations in the number of winners each year and in the amount of time that passes between winners. The random nature of the jackpot award could possibly mean that we just may have a ‘luckier’ year in 2017, than we have experienced in previous years. That being said, it is also the case is that Mega Moolah’s popularity has never been greater with all these big jackpot wins. 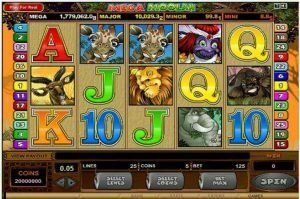 The result is that there are perhaps more spins being played on the Mega Moolah slot now than at any other period in the slot’s history. Thus, the progressive jackpot grows faster and is won within shorter timeframes as more people are playing. A small percentage of any wager goes into the progressive jackpot fund on each and every spin on the game. Given all that, it is little surprise then that the jackpot is being won a lot more frequently. However, it usually takes longer than six days for the jackpot to be won again as it did in September & October 2017! In total, that’s a whopping CAD$62.47 million Mega Moolah Jackpots paid out in 2017. With more than two months remaining in the calendar year, are we looking at a CAD$100 million payout year from a single online progressive slot? Regardless, it is quite possibly already an unofficial record for wins from a single online game. By the looks of that extensive 2017 jackpot list, it would be an unwise decision to bet against the jackpot going off at least one or two more times between now and 31 December. Betway, Jackpot City, William Hill, Spin Palace, Royal Vegas, Ruby Fortune, 888 Casino and All Slots Casino.